We are all about simplicity, modern styles and elegance. The hotel has been designed with a mix of comfort and style, making it ideal whether you are visiting the islands for leisure or business. Its central location makes it close to all amenities; beaches, restaurants, conference centres, nightlife, and it is a short drive from all key spots around Malta. Upon entering Ddream Hotel, you will feel the relaxing atmosphere of our lobby bar, with its glass masterpiece custom-made by a well renowned local artist, where you can sit indoors or unwind out on the terrace to enjoy a drink and a good read from our wide range of wines and books from our small library. Our welcoming team are available both at the lobby and bar 24/7 to assist in any request, and a limited drinks menu is available for room service. Our rooms are finished to high standards allowing you the comfort of various bed, pillow and bath types. Different room categories are available on each floor making it easier to accommodate different requests. Quench & Taste Restaurant is open for breakfast with a wide choice of local and Mediterranean items on the buffet, including cooked options on request. Our dream, as the name goes, was to offer a refreshing concept of a comfortable, convenient and relaxing design hotel in the middle of Malta's most sought-after town, with the primary focus being a friendly team dedicated to giving our guests a memorable experience. The Alexandra Hotel is a well established hotel which has built its success over these past 25 years, gaining experience in the tourism industry along the years, while always keeping our guests as the focal point of our attention. During the past months The Alexandra Hotel went through a full refurbishment process endowing it with the fresh and modern look it has today. The hotel has a total of 188 rooms and 22 apartments situated on 6 floors, all of which enjoy the comfort of a balcony. Ideally located at the heart of St. Julians, whether your stay in Malta is for business or pleasure, The Alexandra Hotel will be the perfect choice for your sojourn. Porto Azzurro is a family run Aparthotel situated in Xemxija over the picturesque port of St. Paul’s Bay on the one side and views of the Maltese countryside on the other. 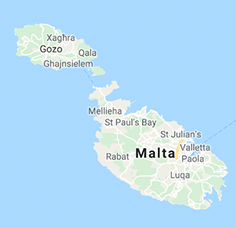 Hire a car and get to the Bugibba area in 10 minutes, to Malta’s main sandy beaches – Golden Bay and Mellieha Bay in 15 minutes, and to the Gozo Ferry in 20 minutes. The Capital of Valletta, the Old Medieval City of Mdina and the lively area of Sliema and St. Julian’s are just 30 minutes away. Our 107 accommodation units are made up of Hotel Rooms, and Self-Catering Studios as well as 1-bedroom Apartments. Enhanced Continental Breakfast is an option not to miss. From April to November guests may enjoy our Outdoor Pool and get the best of the sun. Light Lunch / Snacks are available from the Aqua Lounge at good value prices (May to October). Loungers and Umbrellas are free of charge. Our Indoor Pool is heated from November to April. Gym & Game Room *Dates are indicative and depend on meteorological conditions. *Please note! When booking a minimum of 5 nights by calling (00356) 21585171 (Mon to Fri 9am-4pm local time) or on www.portoazzurro.com.mt or by emailing info@portoazzurro.com.mt you are entitled to: Free Airport-Hotel Transfer on Arrival and Hotel-Airport Transfer on Departure, plus Free Harbour Cruise, departing from Sliema creek (transfers to and from Sliema creek not included). To learn more about your direct booking benefits and terms, click here: Book Direct & Benefit. C. Camilleri & Sons (Catering) Ltd caters for all types of functions, receptions and parties. It also caters for corporate events including staff events, launches and seminars. The company is the exclusive cater at Olive Gardens in Mdina. Also, it caters in independently owned venues providing customised catering solutions. Delivered by trained, polite, and smartly groomed staff, the company’s service complements the excellent food. Furthermore, the company also has an online shop, facilitating any host to entertain in the comfort of their own home by choosing from one of the menus and opting for the finger food to be delivered directly to their door. The online shop also has a vast selection of divine cakes. Southport Villa & Gardens opened its doors as a leading catering complex in June 2008 after an extensive conversion from a private residence to unique venue. Formerly known as Villa St.Rita, the late 19th century home served mainly as a summer residence to the Qutu family from Zejtun. The spacious interiors often welcomed and entertained the family’s guests while the villa’s gardens created a heaven of tranquillity amidst an orchard of fruit trees and a prominent windmill that still stands today as a feature. After a period of neglect the premises was taken over by the current owners who were immediately overwhelmed by its potential. During the restoration great care was taken in order to retain all original features. The design combines a blend of styles that are classic yet contemporary. The final product presents a casual ambience in elegant surroundings. Situated right in the heart of Malta`s prime fishing village, Southport Villa & Gardens offers the perfect location for the travellers alternative dining experience. The picturesque village of Marsaxlokk is known mainly as a traditional fishing harbour and mostly famous for the local market especially on Sunday`s. Southport offers a selection of venues and specifically designed menus to cater for small to larger groups up to 250 guests. These menus are based on local produce especially seafood and are priced to suit all budgets. All food is prepared in-house by a team of dedicate professional chefs. Due to their versatility an infinite possibility of alternative arrangements is always possible to cater for any cuisine or dietary requirement. The unique venues include Leonardo with its formal dining room and terrace overlooking the colourful harbour, the secluded villa`s gardens surrounded by greenery and water features, Vino Lounge which also hosts art exhibitions featuring mainly local artists and also the seaside area right on the water’s edge. Southport welcomes you to an alternative dining experience on any occasion. Whether it’s for a quick brunch, an intimate dinner or simply a laid back evening with friends over a glass of wine, Southport offers the perfect setting. The recently renovated Solana Hotel & Spa is here to offer you the best of all worlds at one of Malta’s most premier luxury accommodations. As a guest you’ll be greeted to a blend of modern aesthetics, a variety of dining options, and amazing features like the rooftop pool. Solana’s prime location in northern Malta takes you far away from the urban noise and close to some of the most beautiful beaches in Malta. Come and experience all the magic that Malta has to offer. Some of Solana’s special features include an indoor pool as well as outdoor pool, sun terrace, spa, and fitness centre. With three restaurants and two bars to choose from, there’s something for every guest here. We also provide catering services and a conference room for large events and business meetings. Our highly-trained staff will be with you to make your stay as pleasant as possible.